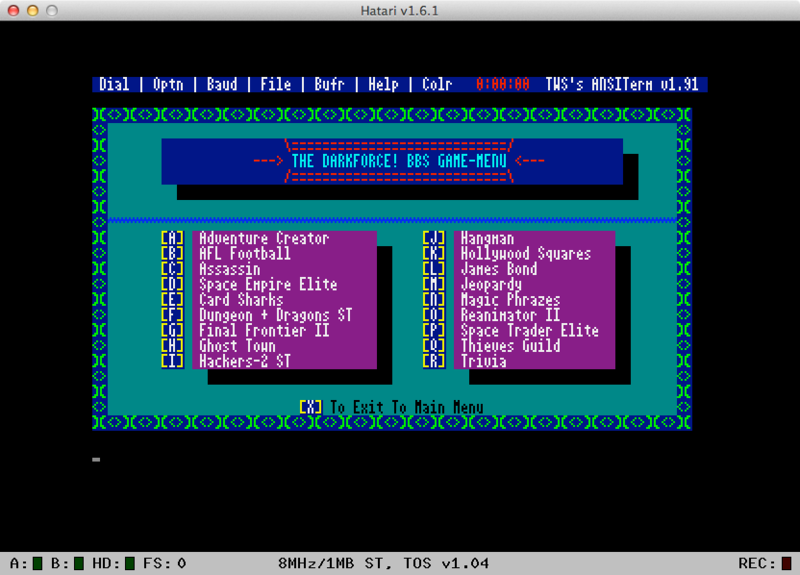 Josh Renaud's blog about BBS history, retro computing and technology reminiscences. When I was a kid calling BBSes, I used an Atari ST computer. However, I rarely if ever used the Atari’s native terminal mode: VT52. The reason is simple. Atari’s VT52 mode offered only 4 colors in medium resolution. PC clones, however had an 80×25 mode with 16 colors and special graphics characters. This was known as ANSI. ANSI graphics were prevalent on BBSes in the early to mid-1990s. VT52 was not. So I stuck to a program called “ANSIterm” which could approximate ANSI graphics on the Atari using some special tricks. Anyway, in recent weeks I’ve been thinking about Space Empire Elite, one of the first BBS door games I ever played. SEE was an Atari ST BBS game and did not support ANSI, so I always played it in plain ASCII mode. How did SEE look in its native VT52 mode? I was curious. But I was also unsure how I might go about experiencing it in VT52 today. 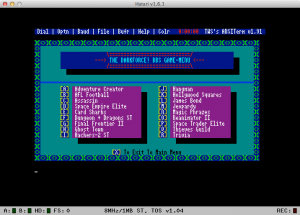 This entry was posted in Uncategorized and tagged ansi, atari st, bbs, emulation, hatari, socat, space empire elite, tcpser, tcpser4j, telnet, vt52 on Dec. 13, 2012 . Disboardia | Austin Seraphin on Austin Seraphin, creator of Barneysplat!